Let us know if you have any questions or need to make other arrangements. Congratulations graduates! Check out these photos from the Phi Theta Kappa All-Minnesota Academic Team. Our members Bado and Mandkhai were in attendance. 5 more days and a few of our officers will be heading off to Washington D.C. to attend ‪#‎NerdNation2016‬! Please join us at our meetings on Tuesday to send them off. Best of luck to Dominique who is running for International Office! We will be rooting for you from MN! Check out these photos from the induction ceremony that Chris Hayes took! We had a great turnout at our Induction Ceremony tonight! Congratulations to all of the new inductees. We are so proud of your hard work. Thank you to all those who helped make tonight so great: our officers (Melissa Rose for putting together tonight and Cheryl for sharing some inspiring words), inductees, family and friends, staff and faculty, specifically Nicki Bottko, Chris Hayes, Ellen Lansky, Dr. Royal. We could not have done this without you! We will post the link to the photos as soon as we can. Fellowship Event with Go Get Your Brush On! Go Get Your Brush On is a mobile canvas painting party service. These paint events are a friendly introduction to painting with acrylics on canvas following the instructor’s step by step directions. It is a great way to relax and get to know other Phi Theta Kappa members. It’s not fine art, it’s FUN art! 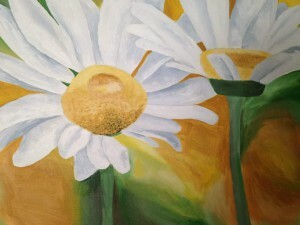 We will be painting the white daisy painting to the left. The artist will bring all of the supplies and we will provide snacks and beverages. Congratulations to Emily Hanek who was elected Vice President of Service and Mizuki Wako who was elected Vice President of Scholarship last week at our officer meeting! We are so excited for these two individuals to join our officer team.